Whilst traditional developments remain in a state of constant decline, Smart developments grow increasingly efficient as the money usually spent on maintenance can be spent on further improvements. Every year the gap between those authorities that have embraced sustainable technology, and those that have not, is growing exponentially. Supply of sustainable infrastructure to reduce downstream maintenance and improve sustainability of the Southern Gateway. Sign-posts, bollards and barriers were installed using the Smart Taper and continue working efficiently today. Recent upgrades included the introduction of spring return posts to reduce damage to Keep left signs that were being impacted on a weekly basis and have not required replacing since. MRWA have used sustainable foundations on traffic signage, with the aim of improving safety and improving effectiveness of their maintenance services. MRWA aim to reduce costs and risks by around 90% over the next 5 years; Reducing the risk of injury to their staff; Reducing disturbance to public and disturbance to underground services; Reducing the on-going consumption of carbon intensive supplies to zero (with the aim of reaching their 2020 target of zero waste ) saving taxpayers millions every year. Main Roads Smart Traffic bollards are secured on sustainable foundations and unlike most removable bollards, if badly impacted are replaced in seconds. These bollards were installed over a decade ago and remain in good condition today. Easily removed for wide loads and maintenance, they are extremely low cost to maintain. As shown left- no damage to foundations when badly impacted. Bollard is simply removed in seconds using tools provided adn a new one dropped into place, autmatically locking in tight. Main Roads had a problem with solid steel (often concrete filled) bike path bollards that were causing injury to bike riders when impacted – so we provided a safe and sustainable solution. 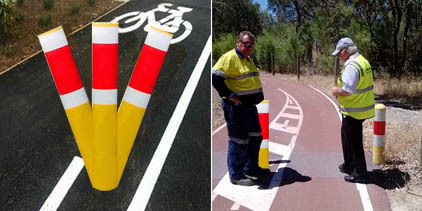 Smart Low Impact Bike Path bollards reduce risk of injury as they are made from soft durable polyethylene compound and deflect upon low impact (and self-recover), are removable and relocatable. Transfield maintenance are responsible for maintaining the grounds at WA's leading award winning tourist destination Hillary's Marina. Transfield has applied Smart technology throught the marina to reduce maintenance costs and improve efficiency of their infrastructure. The Marina is extremely well maintained with all infrastructure secured using Smart foundations. A good example of a Smart development. City of Wanneroo is now using the Smart sustainable foundations and Smart Impact Recovery System to substantially reduce maintenance on Park Bollards. They look like solid in-ground bollards but are impact resistant and easily removable for events and to enable access. KFC is now using the Smart sustainable foundations and Smart Impact Recovery System to substantially reduce maintenance on their driveway bollards. "We were replacing these bollards every second week and the islands were a mess. After using Smart bollards for eighteen months we have not had to replace the bollard even once, it has saved us just so much time and money it's amazing"
Tomen Corporation (Toyota) has taken the Smart Taper to Japan and has established trials with the Nigarta Police Department with the aim of representing Smart Urban in Japan. Trial completed succesfully. Established distributors in Germany, Holland, France and Belgium. German company Signalization BV now offer the new Smart-ground sleeve and thus promote sustainable development in the road equipment. We have earnt a reputation for cost-effective problem solving. Clients now come to us with problems and we devise new and innovative solutions that are cost-effective and sustainable. The result is a revolutionary range of products that provide some of the greatest advancements seen in the road infrastructure industry in decades. We are proud to be part of the revolution in building a more sustainable future. Not including our latest projects, private clients, schools and sports facilities.